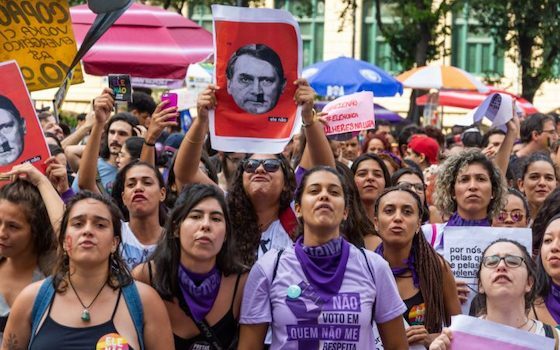 The far-right Brazilian is attempting to mask his fascist platform by leaning into a recently-adopted free-market agenda. Jair Bolsonaro -- a former military man and long-time member of Brazil's Chamber of Deputies representing Rio de Janeiro. Bolsonaro's extreme far-right overtures have earned him the distinction of being compared to Trump, Duterte, and Hitler. Bolsonaro, whose running mate is a retired army general, has built a campaign on his disdain for democracy and glorification of authoritarianism. He's gained infamy worldwide for past comments praising torturers and for asserting during a 1999 televised appearance that the Brazilian dictatorship should have executed "at least 30,000" people. As a presidential candidate, Bolsonaro has called for political opponents to be shot, promised to deny the legitimacy of any election results that don't declare him the winner, and refused to partake in debates ahead of the general elections. Bolsonaro took the lead in the first round of voting with 47 percent of valid votes. In the ten days that followed, there were over 50 cataloged incidents of physical attacks and threats carried out by Bolsonaro supporters in 18 states and the federal district, including the murder of a Bolsonaro critic by a supporter at a bar in the state of Bahia. Given this backdrop of anti-democratic demagoguery, incitement of violence, and virulent bigotry, it might feel inappropriate to give Bolsonaro's candidacy the benefit of a judgement of merit. However, not only does the high possibility of a Bolsonaro presidency force us to contend with the implications of his policy proposals, it requires us to understand that neoliberalism isn't only a feature of his candidacy -- it's the means by which his candidacy has been made viable. The 1964 dictatorship in Brazil was installed by a military coup aimed at blocking the administration of a president who was seen at the time being as too left-wing. The coup was supported by many well-to-do Brazilians at the time. "And why not?" journalist Vincent Bevins asked recently in the New York Review of Books. "If you were rich and stayed in line politically, things were never that bad -- this kind of nostalgia [is] often reproduced in media and historical memory." Recent surveys have found that 55 percent of Brazilians wouldn't mind a non-democratic form of government if it "solved problems." And Brazilians have legitimate problems, among which healthcare, citizen security, corruption, unemployment, and education have ranked as highly important in recent polls. Bolsonaro's campaign recipe has not only been to promote -- through no shortage of lies and misinformation -- shortcuts to democratic and civic processes. He's also aligned himself with corporate and financial interests, attracting support from moderates willing to overlook, understate, and ultimately mask his fascist nature by leaning into his recently-adopted free-market agenda. "The core of Bolsonarism," a Jacobin article says, "is hatred of the organized working class, of trade unions, which today…is incarnated in PT and, above all, in the image of Lula," Brazil's former president, for whom Haddad is filling in as candidate. Lula, who is in jail on flimsy bribery charges, has not been allowed to run. But why so much hatred for PT? The party was recently in power for over 13 years, or three and a half presidential terms, spanning the tenures of Lula and former President Dilma Rousseff. Lula's investment in social programs during a time of booming economic expansion in Brazil has been credited with lifting 30 million Brazilians out of poverty, and for giving poor, Black and Brown, female, and otherwise disadvantaged Brazilians unprecedented opportunity for advancement. Tensions grew under Dilma's tenure over her mismanagement of the economy. Socioeconomic indicators began to reverse course as Brazil entered into one the worst recession of the last quarter century. Coupled with her support for the massive anti-corruption investigation taking place, which implicated a large proportion of the sitting members of Congress, political opponents saw her as a problem to resolve quickly. They conspired to successfully impeach her from office in a process that's been described by many as a "soft" coup d'état. Dilma was succeeded by a coalition-government member from a center party, then-Vice President Michel Temer, who has spent the last two years overseeing the implementation of severe austerity measures and other reforms that have especially hurt the poor and the previously-growing middle class. This election is marked with widespread and deep resentment for the PT's handling of the economy. But the PT is also unreasonably singled out for its role in corruption. Haddad recently recognized PT's errors on the economy and their role in corruption in a public mea culpa, promising reform if elected. But the selective scapegoating of PT when it comes to corruption is unfair for several reasons. First of all, it was during a PT administration that the country's largest corruption investigation in the country's history was enabled. The singular focus on the PT is also incongruent with Brazilians' perception of corruption generally, and fails to consider the ubiquity of corruption across political parties in our government. Over 83 percent of Brazilians believe that more than half of all politicians are corrupt. And their perceptions aren't totally off: more than half of Brazilian senators and one third of the members of Brazil's lower chamber of Congress face criminal accusations. Bolsonaro has taken advantage of this anti-PT, anti-left, anti-government, anti-corruption sentiment by touting extra-democratic governance and adopting a neoliberal agenda. But history always offers a well of insights. "It's really strange that so many people now believe that the military regime somehow delivered safety to Brazilians or managed the economy well, since, by the end of the 1970s, they were very often seen as corrupt and incompetent, and crime statistics were worsening due to the government's own policies," historian Marcos Napolitano told the New York Review of Books. Napolitano's research, Bevins writes, "has shown that by encouraging mass migration into urban slums with no public services, and allowing a militarized police to routinely use extra-judicial killings to control marginalized populations, the dictatorship actually set the country on the path toward its current widespread violence." "We have two persistent phenomena: violence against women and criminal gangs dealing in drugs and arms," said Renato Sérgio de Lima, director of the Brazilian Public Security Forum. This violence is largely linked to poverty and inequality -- including the criminalization of poverty in Brazil. Dealing with it requires a comprehensive intervention that starts with significant investment in and economic inclusion of marginalized communities. In contrast to the nationalistic economic tendencies gleaned from his 27-year Congressional voting record, Bolsonaro has chosen Paulo Guedes, a "Chicago Boy" neoliberal economist, as his main economic advisor. Guedes's policy recommendations include privatizing almost all state-run companies, opening up the Amazon to foreign development, and further cutting social spending. Guedes is currently under investigation for possible securities fraud, but the irony is clearly lost on Bolsonaro supporters. Bolsonaro's economic promises, many of them documented on Instagram, include across-the-board deregulation, a refusal to tax the wealthy and their inheritances, a commitment to cutting taxes overall, and a reduction to Bolsa Fam'lia, a successful conditional cash transfer program, under the guise of fighting fraud in the system. Bolsonaro has capitalized on Brazil's deep economic and social inequality to push for an agenda that will undoubtedly drive even bigger rifts into the Brazilian socioeconomic fabric and further disenfranchise the country's most vulnerable people. We must fight to defend our democracy and human rights. But we should not lose sight of the importance of fighting the corporate and financial powers that are not only extractive in their own right, but are also being used as vehicles for authoritarianism. Latin America: "Inequality and Bolsonaro's Rise in Brazil"